Monitoring your wellhead with AxsDirect™ is extremely simple: you have direct communication with pump controllers on an individual basis 24/7. 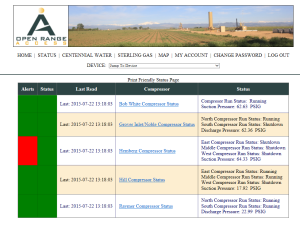 Through the use of a web-enabled communications device (a laptop, PDA, cell phone, or pager), you can check the status of the wellhead, receive alerts and make changes as needed. With the AxsDirect™ easy-to-use web interface, the data you need to make smart decisions is only a click away.